Enjoy the silence before the storm, cause the new Dohr & Mangold is about to rush in. The German duo teamed up with US singer Jonathan Mendelsohn, with the deep bassed houser 'Hurricane' hitting in with full effect! Trembling the grounds and shaking clubs to its foundations, is exactly what 'Hurricane' will do. 2 years after the all-destroying ''B.I.C. (Born In Chicago)', Dohr & Mangold return to the Armada Music label, road-testing a shiny new Trice Recordings. 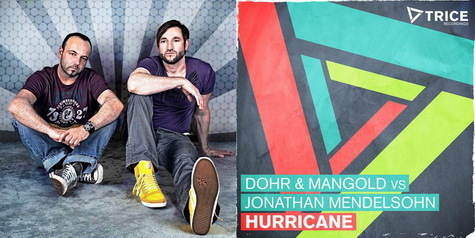 'Hurricane' rides the powerful vocals of Jonathan Mendelsohn, who's previously worked with the likes of Dash Berlin, Way Out West and Laidback Luke. This time, he was invited by Dohr & Mangold, and boy, do they know how to handle a voice like that. 'Hurricane' builds and builds, unleashing the beast in every by CouponDropDown" href="http://www.houseplanet.dj/">club it meets.